A Jane Austen-inspired Pirate Romance Sophie Crestwood is never going to catch a husband, and she isn’t even sure she wants one. Her father is a gossip, her mother always has her nose in a book, and little Jack has shamefully been dismissed from boarding school. Worst of all, a pirate moves next door into Pembroke Hall! When Sophie’s sent to a matchmaking party at a neighboring estate, the pirate from Pembroke arrives and distracts everyone from the summer festivities. Unguarded, her feelings about the mysterious Captain Murdock bloom into a trusted friendship that Sophie fears may come to mean much more than anyone would ever suspect. Keeping company with a reputed pirate is one thing but falling in love with him could ruin the eccentric Crestwood family for good. 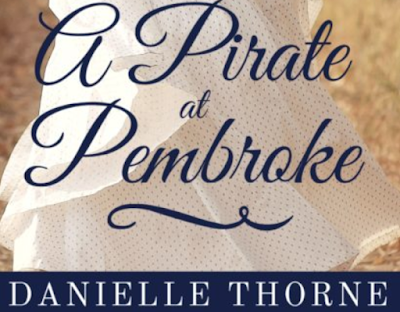 Danielle Thorne's book A Pirate at Pembroke is up for nomination in the Kindle Scout Contest. Please vote for her book! If Kindle Scout selects A Pirate at Pembroke for publication you'll get a copy of the book for free! The sad sonata continued its siren's call. It echoed a passionate and haunting melody, just like the dark halls of Pembroke with its soiled paintings of aristocrats from long ago. Sophie examined the chamber doors through the gloom and decided the door to the second room on the left was slightly ajar with a dim light shimmering around it. She moved in silence to the small gap and caught her breath. Captain Murdock stood in front of a languid fire burning beneath a marble mantel. One bare foot was balanced on a low, milking stool nestled up against a heavy, velvet-covered chair. The other kept time on the floor. With his cane leaning against the fireplace, Murdock stood balanced on his own. In his hands, a violin tucked underneath his chin swayed. It moved in time with his body as he performed a strange dance to the music. His profile in the firelight was sharp and clear. He stood slender and tall. In these private bedchambers, half-dressed in loose buckskin breeches and an untucked shirt open at the neck, he did not seem as rigid and menacing as before. From his dreamy stare, his thoughts were somewhere inside the flickering blue and orange flames. The reflection of the firelight made his pale eyes glow. Sophie noticed his hair was undone. It hung far past his neck, with slight waves resting on his broad upper back on either side of his shoulders. She put a hand to her mouth realizing it had fallen open, and at the same time, that it was scandalous to spy on her host. She swallowed and stepped away. The music stopped in mid-cry. Her heart jumped in her chest, and for a brief pause, the only sound to be heard was her own loud breathing. She stepped back and pivoted on her heel. Horrified he might have felt her examination, she strode down the rug-lined hallway as quietly as she could, but each footfall sounded like muffled thunder as she hurried back to the stairs. She reached the banister and slipped down the first step, but her shift snagged on something, and she spun about to free it. Captain Murdock stood behind her, silent. He held a handful of her shift in his fist. She had not snagged it after all. Rather, he had snagged her. She jerked in surprise, but his hold kept her from falling backward and tumbling down the stairs. His other hand trembled as it balanced precariously on a carved dragon head at the top of his cane. "What do you think you are doing?" "I… I heard music and followed it." His eyes blazed with accusation, and it unnerved her. "I'm so sorry," she said in a choking voice. Her nose tingled again. She touched it with her fingers to make it stop. "It's not possible you heard music from all the way down in your room." Sophie took a nervous breath. He stood there, one step above her like a giant, her bedclothes gripped in his hand so tight it shook. She hadn't heard him shuffle down the hall after her. He moved as silent as a ghost when he wanted -- even with a cane. She found the courage to meet his penetrating gaze. "I did hear something from my room. Then I was in the hall." Captain Murdock waited for a long pause, while the dust they had stirred up in the rugs pirouetted in the air and into Sophie's eyes and nose. "You should not be out of bed," he said. Sophie swallowed down her frightened apprehension. She tried to beg his pardon, but her lungs failed her, and she coughed in reflex. She covered her mouth with her fingers. "I'm so sorry," she repeated between them, her cheeks hot with humiliation. She stared at the fistful of her garments he'd snatched, aware his eyes examined her from her straight, waist-length hair down to her naked ankles. With a jerk, he dropped her shift like it burned his hand. "Go to bed," he said in a quiet voice. Sophie's nose had not quit tingling and itching. "Yes, sir," she said at once, but not soon enough to keep a sneeze from erupting. It came so fast and without warning, she had no chance to catch it before it doused him with all her rejection. Horrified, she stumbled down the next step, thankful the old handrail held fast. When she glanced back, he was wiping off his shirt with a look of disgust. Danielle Thorne is the author of classic romance and adventure in several genres. She loves Jane Austen, pirates, beaches, cookies, antiques, cats, dogs, and long naps. She does not like phone calls or sushi. A graduate of Ricks College and BYU-Idaho, Danielle saw early work published by Every Day Fiction, Arts and Prose Magazine, Mississippi Crow, The Nantahala Review, StorySouth, and… you get the idea. Besides writing, she’s edited for both Solstice and Desert Breeze Publishing. Her growing blog, The Balanced Writer, focuses on writing, life, and the pursuit of peace and happiness. Currently, Danielle freelances as a non-fiction author while waiting to hear from readers like you through her website. During free time, which means when Netflix is down, she combs through feedback and offers virtual hugs for reviews. 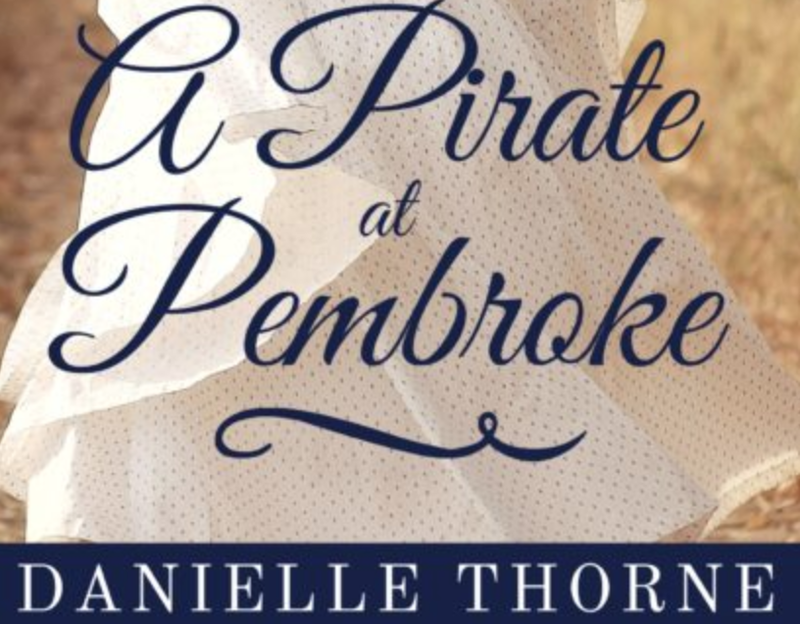 A Pirate at Pembroke is her newest release. Her non-fiction book, The Story of Queen Victoria 200 Years After Her Birth, is coming fall 2018.